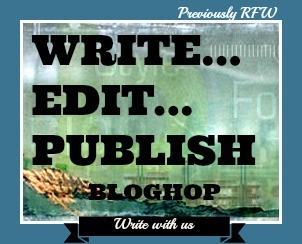 This is the first challenge for Write...Edit...Publish - a monthly bloghop. Katy was excited. Her mum and dad said they were going to Paris, to a theme park. It must be Disneyland Paris. They would be driving to France and camping but first they have to get across the sea or rather they would go under the sea using The Tunnel which was boring because you couldn't see anything. Camping for a fortnight with no television! There would be swimming pools and her mum and dad were going to send her brother and herself off to ‘camp activities’ every morning so that they could have some peace. There would be other eight year old girls from England and her stupid brother could go off and be a nuisance playing football with the other boys. She supposed she’d have to do face painting and pretend to be an animal and listen to stories and run races. The tent was alright but she had to share a compartment with Bobby who used all his space and then pinched her space as well, then she got told off by her mum for not being tidy. She tried to tell her mum that Bobby had taken all the space but her dad butted in and told her to stick up for herself. Sometimes grown-ups really didn't understand what it was like to have a big brother. Camping was fun but the arguments over taking the dirty dishes down to the washing area were getting on her nerves. Dad was supposed to go with them but he usually disappeared off somewhere once he had shown them what to do. Bobby insisted on washing-up but he didn’t do that properly and she had to put the dishes back in the water so then he would splash her and start shouting at her. When they eventually got back to the tent her dad told her to stop sulking but he wouldn't listen to her explanation of what had happened. He just said they were all on holiday and they all had to pull their own weight. Yeah, right, she thought, you don't do much to help, mum’s always cooking just as she does at home. Perhaps I should have been born a boy; they get away with a lot of stuff. Their campsite was on the outskirts of Paris and on the day her dad got them up early so they could drive to the other side of Paris to reach the theme park as soon as it opened. Mum wasn't any good at reading the map and she didn't like driving on the wrong side of the road so Dad was always yelling at her for not telling him quickly enough which way to go. Bobby was asleep in the back of the car so that he didn't have to listen to the rows, Katy tried to sleep as well but she could still hear dad bickering at mum. She was really thirsty but didn't dare ask for a drink, then a few minutes later dad pulled into one of those roadside cafés. They got out, stretched their legs and had an ice cold bottle of Coke as a treat as it was too expensive to buy at home. ‘I want to see Cinderella at Disney,’ Katy said with a mouthful of croissant. A look from her mum made her swallow the crumbs quickly and pick up the serviette. It was stupid really, she was only going to get more around her lips, she might as well wait until she’d finished eating. Katy couldn’t believe it, not Disneyland. Why would they lie? Bobby nudged her hard, making faces at her when their parents weren’t looking. The explanation came from her Dad. ‘So you know the Romans came to France before they came to England, Katy?’ He didn't bother waiting for her to answer. He smiled at Katy and took her hand, squeezed it lightly and then went back to drinking his coffee. Oh yeah, fantastic, Katy thought. It was such a boy thing to do, Romans fighting, ancient Gauls fighting and Greeks and whoever else. The only thing that will be any fun at all will be the dolphins and I bet we won't have time to do that either by the time we’ve waited in line, queuing for hours on end to get on a stupid roller coaster. She could see her mum blinking hard. The girls in the family they were never, ever allowed to do what they wanted. Last year they’d had to traipse round a tank museum for goodness sake! Tanks and guns, more boy things. Katy liked roller coasters, in fact she quite enjoyed the thrill of it all so long as it wasn't too high or sharp. Her mum didn't like the rides and would always wait for them outside but they did persuade her to go on a Ghost Train once. That was so funny. She freaked, especially when they came out and the life-sized dummy spoke to her. Dad and Bobby were waiting for them to come out and laughed and laughed at her mum when she jumped out of her skin. Much later that night Katy admitted tiredly that it had been a fun filled day. She had enjoyed meeting Obelisk and seeing the olden villages and Roman gladiators and the dolphin show. She would dream well tonight of a sword fight to save a princess. She would make sure her dad took them to Disneyland next year. She could save some of her pocket money to help out. I like the voice in this story. It definitely sounds like a little girl narrating. :) Fun story! Good story. I'm also glad she had a good time despite it all. A cute photo which matches this cute story. At the end of the day, Katy had a great time! So all's well that ends well. What a happy ending to a story that was a little troubled. I can totally relate to Katy, having her hopes of going to Euro Disney dashed for Asterix. I was hoping to hear about Euro Disney as I'm going there in December! Now I'll have to add this one to the list, lol! Well told from the little girl's POV Sally. Love the addition of the photo. Thank you so much for posting to the inaugural WEP bloghop. I"m having fun reading the entries. How about you? Or are you waiting for Friday when all the posts should be up? Oooh, that is so cool that there is an Asterisk them Park. My son would have loved that when he was younger. Katy is right, though, the boys often get to run the show when it comes to trips. I guess I'm lucky I came from a family of 5 girls and just 1 boy. Great story. You've combined the gender issues with the holiday tale well. The little girl's pov is very convincing. I just want to say I love your writing! You captured it all so perfectly, Sally! Just like the family vacations that we used to go on, and Dad always got his way. Though he did help with the cooking. I just want to give Katy a hug! Heck with Disney - Parc Astérix would be much more fun. Of course, I'm a roller coaster junkie and that part is on my list. Oh boy, Disney. Disney World, Disney Land, Disney Cruises, Disney Paris and I think there is a Disney Japan. I so relate to your little girl. Though I do believe Parc Asterix would be fun. I love the Renaissance Festival here. I thought you captured your character well. 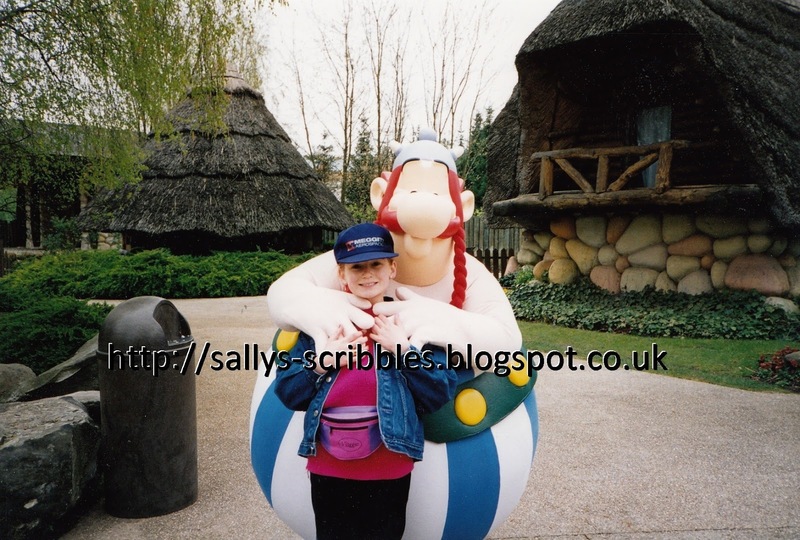 I would LOVE to go to Parc Asterix! I've wanted to go since it opened. We have all the Asterix "comic" books and our kids love them too. Lucky Katy getting to go! Oh, poor Katy - 'next year, maybe' . . .